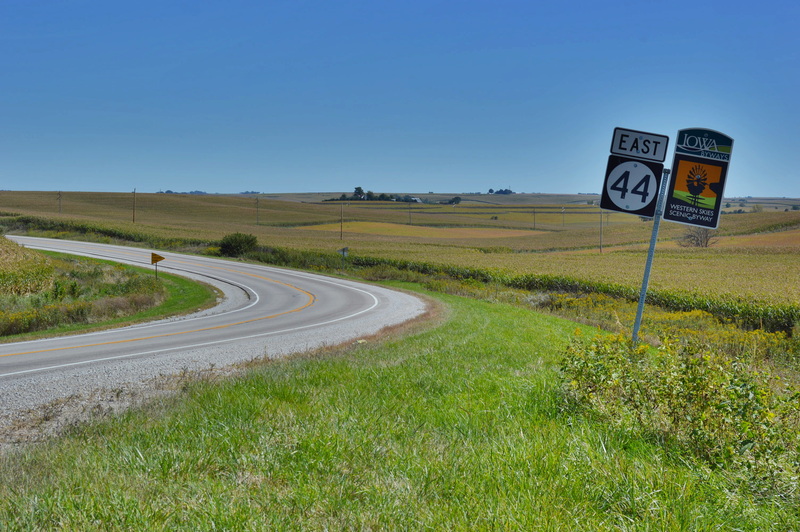 Vibrant small towns and idyllic views of rural Iowa define the Western Skies Scenic Byway, stretching 142-miles-long through Harrison, Shelby, Audubon and Guthrie counties in west-central Iowa. That heritage stems from the area’s early settlers: European immigrants with farming backgrounds who sought fertile soil in western Iowa, and brought with them an adaptability to change with the times, she said. The Museum of Danish America and the Danish Windmill, both in Elk Horn, as well as historical villages in Guthrie and Harrison counties, showcase the area’s rich history, while chic restaurants, such as Roux’s, located in the heart of the Woodbine Main Street District, offer modern American menus that balance tradition and innovation. Ross Clark, Roux’s chef and founder, completed his studies at Le Cordon Bleu, one of the region’s preeminent culinary schools, before returning to his home of Woodbine. Clark is among the byway’s small business owners who ensure that hungry and thirsty diners have access to the same amenities, such as craft beer and local ingredients, available at restaurants in much larger cities. 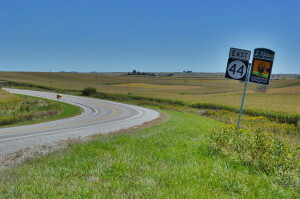 Meanwhile, travelers driving along Highway 44 — the byway’s main route — are rewarded with stunning views of rolling hills and farmland. 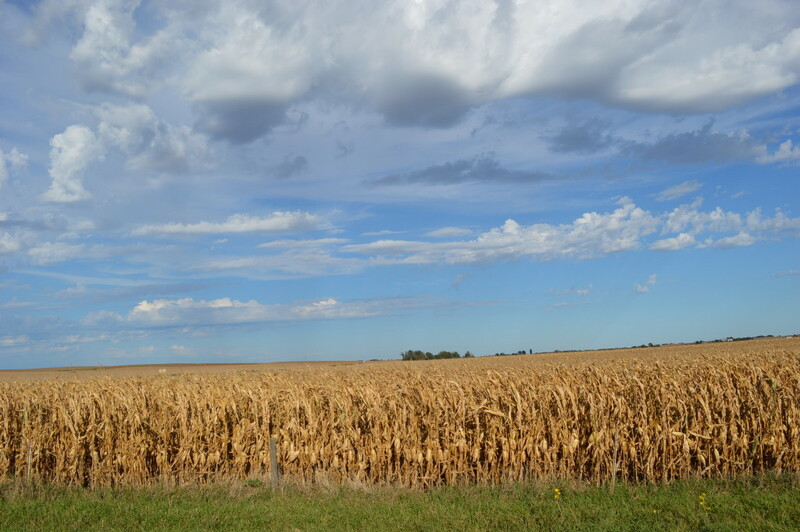 “It’s open and beautiful and you can see for miles and miles,” Windmuller said. 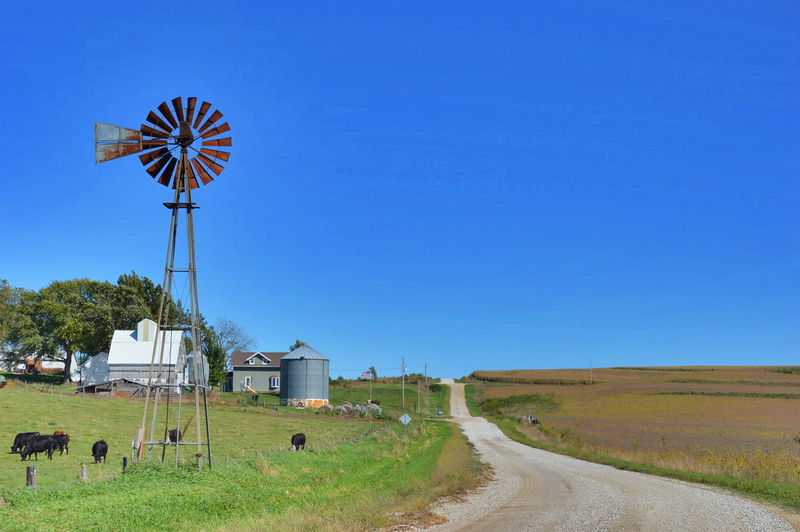 Tucked among those gentle hills, Early Morning Harvest, a farm at the eastern edge of the byway, just south of Panora, epitomizes that sense of adaptability. With the backdrop of a stately white barn and attached 40-by-140-foot greenhouse, farmer Jeff Hafner has developed a myriad of new practices and products that are finding their way to tables throughout the state. Passing through the air barrier from the barn to the greenhouse feels like stepping through a door to a different world. 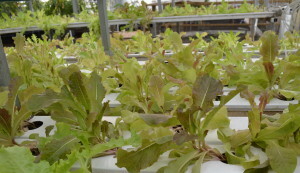 Kale takes on prehistoric shapes growing from raft beds; hundreds of tilapia swim in deep, dark tanks; tubes intertwine like a science experiment to connect the water systems, and plants such as lettuce, onions, peppers, tomatoes, Thai basil and red malabar spinach fill each corner. “The goal is to use every space of the greenhouse,” Hafner said. Lettuce and other vegetables are harvested weekly and the mild-tasting white fish are sold live from the farm. Hafner follows organic practices in the aquaponics operation, striking a delicate balance between the water that is cleansed by the growing plants and the tilapia fish that fertilize the plants. 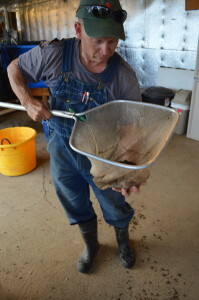 Organic corn meal grown on the farm and diatomaceous earth are among the pest controls used in the greenhouse. Early Morning Harvest’s certified organic farmland grows wheat, corn, rye, buckwheat and oats, while pastured poultry for eggs and grass-fed beef also play a role in the farm equation. Raw, unpasteurized clover honey from the farm is sold through the Cedar Rapids-based Iowa Valley Food Co-op and other outlets. 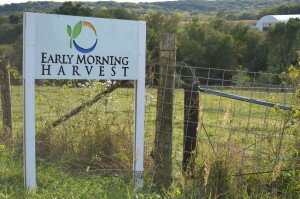 Stone-ground oatmeal, corn meal, corn grits and several varieties of flour are among the organic grains sold by Early Morning Harvest at its on-farm store, as well as Iowa Valley Food Co-op, FarmTable Delivery in Harlan, and sites such as New Pioneer Food Co-op, which also uses the grains in its breads and other products. 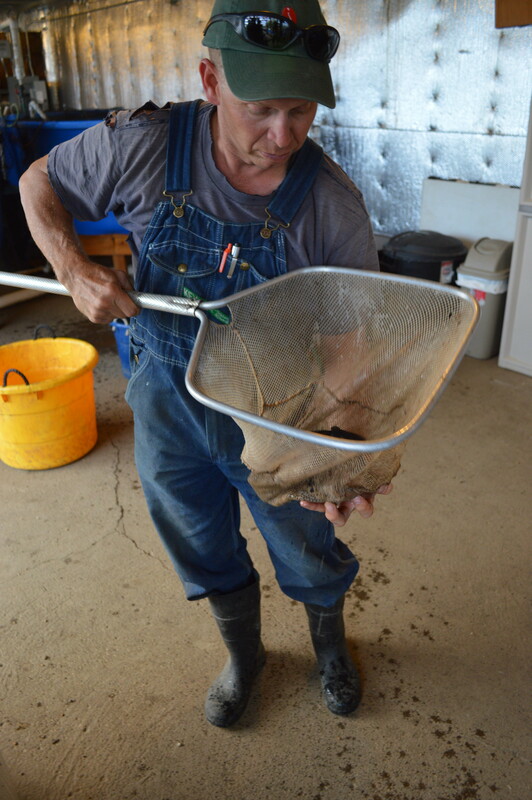 A 20-inch stone mill in a sterile section of the barn is the heart of the on-farm milling operation. Hafner, who served in the U.S. Army in Iraq, describes the farm’s diversification as a learning process. At the other end of the byway, Andrew Pittz works on diversification at a different type of operation. Pittz is the driving force behind Sawmill Hollow Family Farm in Missouri Valley. The farm has made a name for itself with aronia berries, a fruit that was nearly absent from Iowa until his parents, Vaughn and Cindy Pittz, planted 207 of the bushes in 1997. 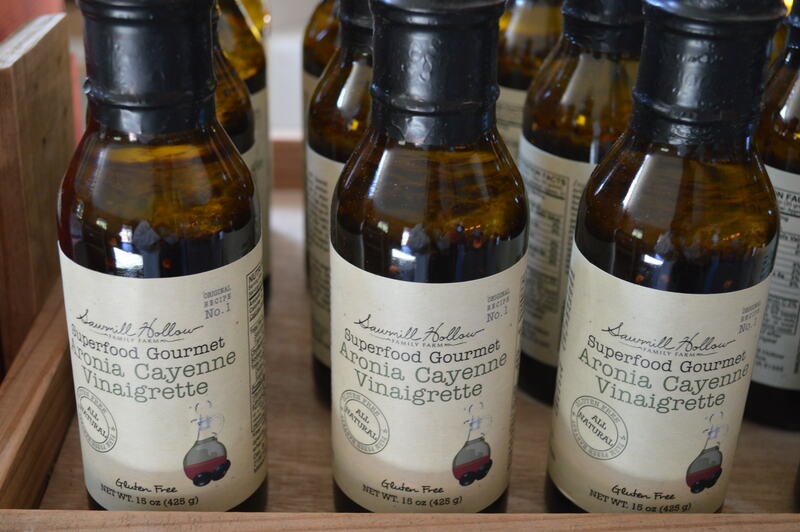 The organic farm has added plants over the years and pushed for development of various aronia berry products, including jelly, wines, salsa, vinaigrette and even an aronia berry capsule. An on-farm store with full-wraparound porch is the central hub for Sawmill Hollow’s annual North American Aronia Berry Festival, which takes place the third weekend of September, with space for area artisans to sell jewelry and more. 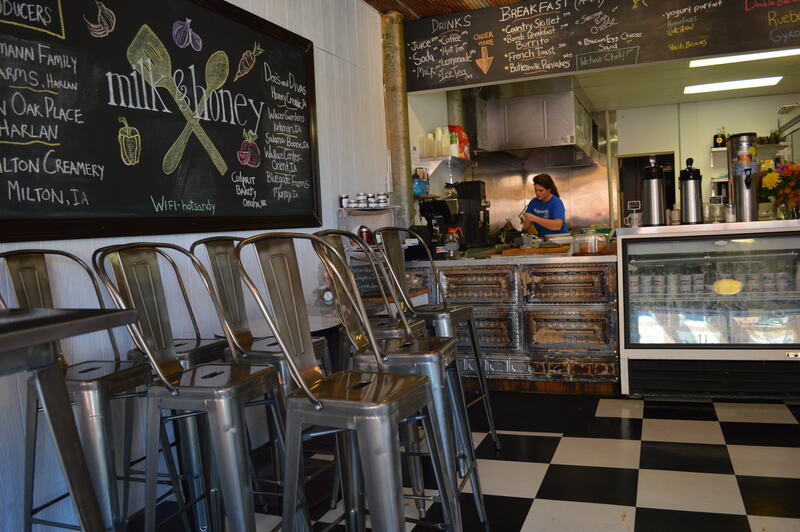 Another prime example of farming diversification is underway in Harlan, where members of the Rosmann family have opened Milk & Honey, a cafe that serves breakfast and lunch with a decidedly local flavor. 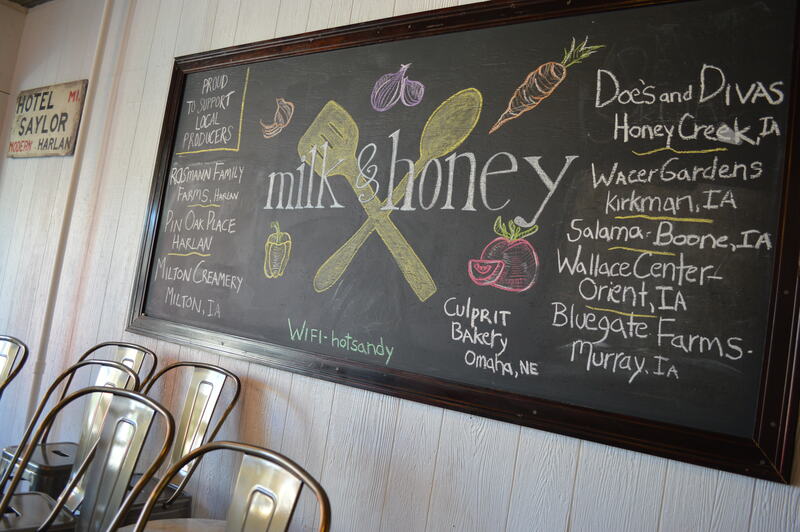 A chalkboard menu lists the Milton Creamery, Pin Oak Place and the family’s own Rosmann Family Farms among the producers whose products keep customers coming back to the new restaurant in the historic Hotel Saylor in the heart of Harlan. Manager Hans Walsh, whose brother-in-law and sister, Daniel and Ellen Walsh-Rosmann, opened Milk & Honey in June, said all of the beef and pork comes from the Rosmann Family Farms and other products are sourced “as local as possible.” The couple also operate FarmTable Delivery, a Harlan- based procurement business that works with small- and mid-sized farms, helping bring their fresh, organic produce to chefs, grocery stores and buying clubs. 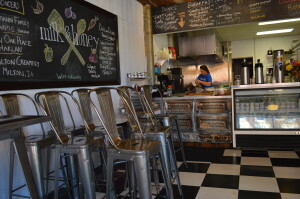 New and returning customers at Milk & Honey seek out the cafe’s Bomb Breakfast Burrito, with crispy hash browns, bacon, salsa, fried egg and shredded cheddar in a flour tortilla and the BLT, made with cottage bacon and heirloom tomatoes, among the mouth-watering items on the seasonally changing menu. 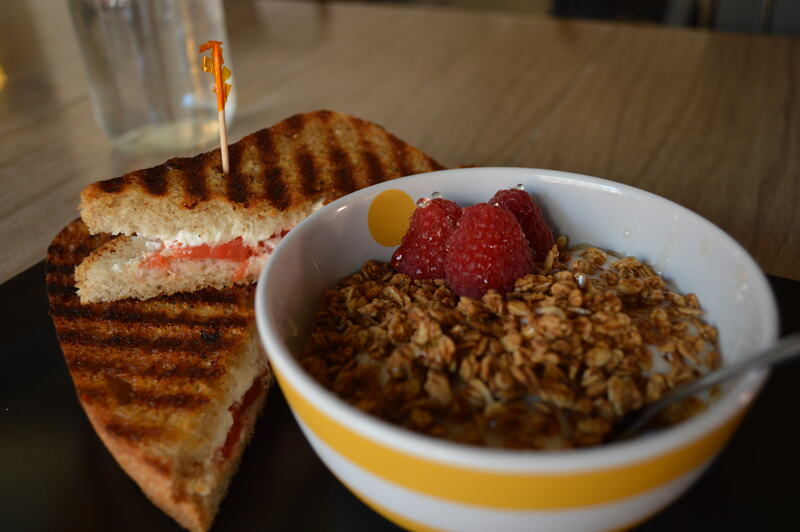 Cheryl Bissen and Reid Zimmerman traveled 20 minutes from Kimballton to dine on the Reuben and chicken caprese sandwiches, along with yogurt parfaits. Bissen, who requires a gluten-free diet, said the food was worth the trip. Read more about local foods in Iowa at Edible Iowa River Valley magazine. 6 cups organic rolled oats from Grain Place Foods, Marquette, Neb. 3. Bake @ 275 for 45 mins., spreading around every 15 mins. until darker, not burned. 4. Let cool for 60 mins before placing in airtight container. 3. Drizzle small amount of Bountiful Blossoms Bee Co. honey on top. 4. Top with berries or any desired topping. Serve.